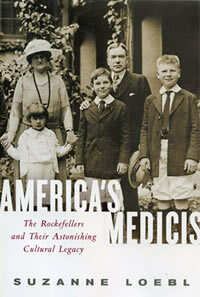 There are many books about the Rockefellers, but America’s Medicis: The Rockefellers and Their Astonishing Cultural Legacy is the only one that presents the complete history of all the museums and building projects the second (John D. Rockefeller and Abby A. Rockefeller) and third (Abby, John D. 3rd, Nelson, Laurance, Winthrop and David Rockefeller) generations sponsored. The book contains a wealth of new information pertaining to their major gifts as well as the unfamiliar ones, including the Wendell Gilley Museum in Southwest Harbor, Maine, the Marsh-Billings-Rockefeller Mansion in Woodstock, Vermont, and the Rockefeller Archaeological Museum in Jerusalem. The Economist highlighted the ruthlessness of John D. Rockefeller, Sr., his business practices, and fervor for his Baptist faith, his son’s love of fine art and craftsmanship, and of his “unconcealed puzzlement” when his wife “threw herself into collecting modern art” and became “the driving spirit in the founding of New York’s Museum of Modern Art.” The doyenne’s enthusiasm led to a continuous eighty-year-long involvement of her descendents with the museum.